Hear from the program participants as they share their "Sons of the West" experiences and learnings. What have you achieved in SOTW? The Sons of the West men go behind the scenes at the Kennel, hearing from a panel of Club experts sharing their health and wellbeing tips. Man to Man - Five men. Five life-changing stories. 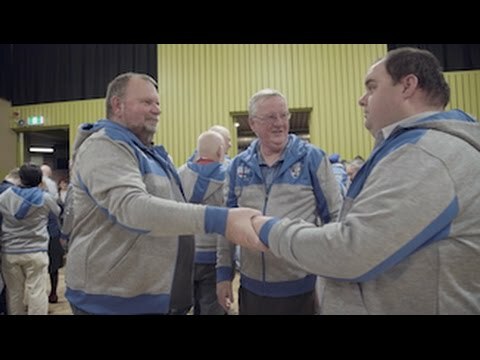 Witness first-hand the Club’s deep commitment to its community, in this inspiring documentary exploration of the ‘Sons of the West’ program. Sons of the West: Get into it! TWO BALD BULLDOGS w/ Shane Delia & Tony Liberatore. Episode 5. We've saved the best for last. This Pork Meatballs and Pasta recipe is quick, it's easy, it's filling and just might be the tastiest meal of the 2015 series AND you can enjoy it guilt free. The short film is a deeply personal reflection of one man’s SOTW experience, and Jonathan Manallack was brave enough to take us along with him on his journey. The video at the beginning of Saturday night's graduation was a brief wrap of this year's program. Inspiring stuff. Do yourself a favour. TWO BALD BULLDOGS w/ Shane Delia & Tony Liberatore. Episode 4. Get your day started the right way with a healthy and delicious breakfast omelette in the fourth episode of TWO BALD BULLDOGS. TWO BALD BULLDOGS w/ Shane Delia & Tony Liberatore. Episode 3. Everybody loves chicken. Let Libba and Shane show you how you can turn a basic stir-fry into a a colourful, tasty and protein packed delight! 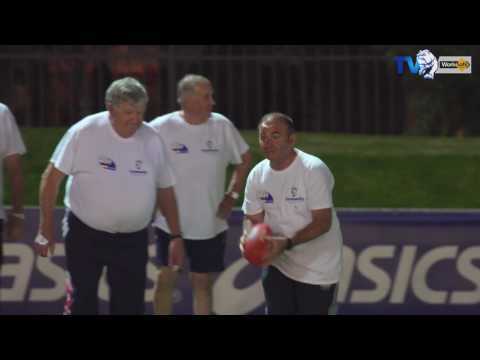 TWO BALD BULLDOGS w/ Shane Delia & Tony Liberatore. Episode 2. Episode Two is a simple and tasty Fish dish. Lean and full of protein, impress the family with the latest Two Bald Bulldogs meal idea from Shane Delia and Tony Liberatore. Confederation of Australian Motor Sports CEO Eugene Arocca will be talking to men in Footscray on Thursday June 4 about his brush with bowel cancer. Here, the former North Melbourne Football Club chief discusses why putting off getting the test almost cost him his life. The FIFTH and final video in the home exercise series is a full body circuit that is guaranteed to get your heart rate up. If you're pressed for time, this is the video for you. The fourth video in the home exercise series targets your core. Click HERE for a workout INFO SHEET. The third video in the home exercise series utilises any dumbbells or bricks you have lying around the house. The second video in the home exercise series is circuit based and will target your upper body. Clay Smith and Tom Campbell stop by a cooking class as part of the Sons of the West men’s health program. The first video in the home exercise series is circuit based and focuses on your legs and glutes. Watch a trailer and preview of the upcoming exercise tips video series hosted by Sons of the West ambassador and former Bulldogs full back Steve Kretiuk. 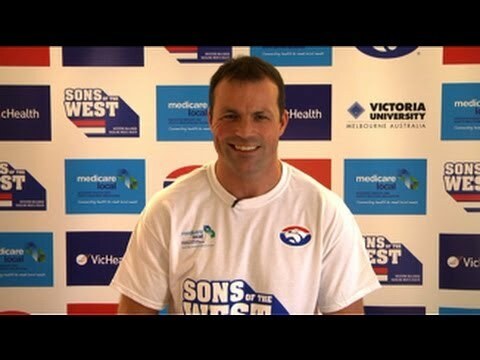 The new season of Sons of the West was launched at Victoria University Whitten Oval in March followed by five massive men's health expos right across Melbourne's West. 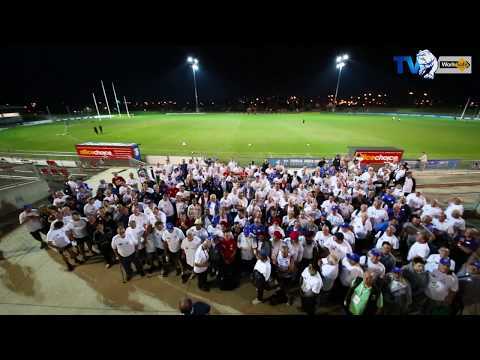 Watch the Channel Nine News Melbourne feature on the 'Sons of the West' Men's Health Program graduation held at Victoria University Whitten Oval. .
We played this video at the graduation ceremony right before the jumper presentations. It captures what the program has been all about. 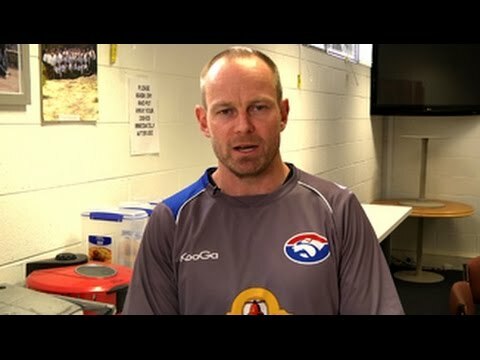 As part of the Bulldogs' men's health program Sons of the West, High Performance Manager Justin Cordy delivers some tips for starting your day the right way. 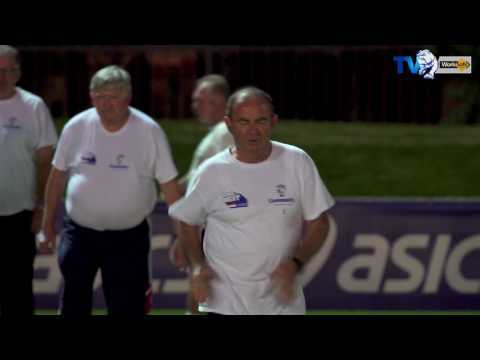 General Manager of Football Graham Lowe delivers some tips for training effectively and achieving your exercise goals. Scott West and Tony Liberatore made a trip to Masters in Braybrook to impart some DIY wisdom to Sons of the West program members. 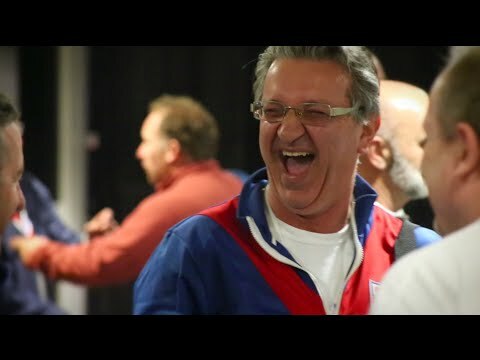 The Bulldogs give one of their biggest fans a surprise he will never forget. This is an emotional tale of support and changing your life for the better. Johnno's Message: Do your mid-program check and be rewarded! Brad Johnson took time out from a recent exercise session with the men of Hobsons Bay Council to talk about the importance of doing your mid-program health check. Head Chef of Maha Restaurant and Sons of the West Program Ambassador Shane Delia discusses the importance of healthy eating, and his passion for men's health issues. 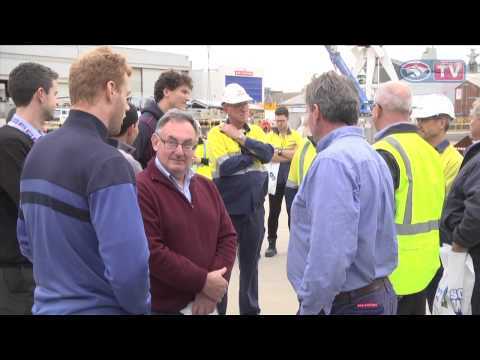 Program Ambassadors Will Minson and Adam Cooney made a trip down to BAE Systems in Williamstown to raise awareness about the Bulldogs' men's health program Sons of the West, have a kick with the workers and help get them on board. We also spoke to Minson about the benefits of the program. 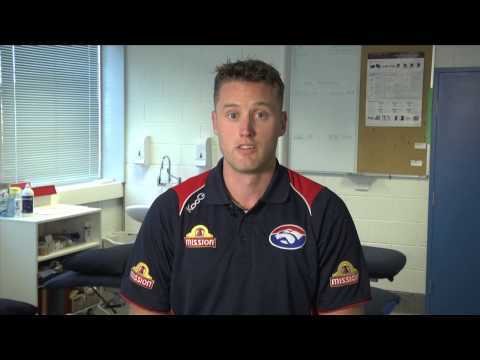 The Western Bulldogs' men's health program is recruiting members! 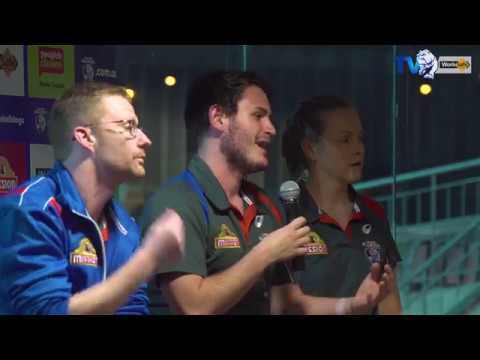 The Sons of the West gathered at Victoria University Whitten Oval for a health expo and we spoke to program ambassadors Doug Hawkins and Steve Kretiuk about the importance of men's health in the Western region. Get down to the Victoria University Whitten Oval for the Sons of the West sign up Expo this Sunday 18th May! 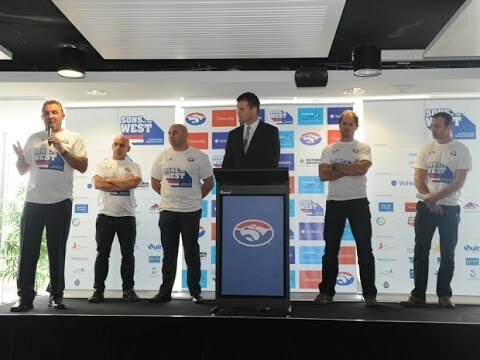 BulldogsTV was on hand as the Western Bulldogs today launched Sons of the West, a $1.2 million men's health initiative developed in alliance with the Liverpool FC Foundation " the community arm of English Premier League powerhouse, Liverpool FC (LFC). AFL CEO Andrew Demetriou, media identities Luke Darcy and Gerard Healy, celebrity chef Shane Delia and past players Doug Hawkins, Brad Johnson, Steve Kretiuk, Scott West and Tony Liberatore.